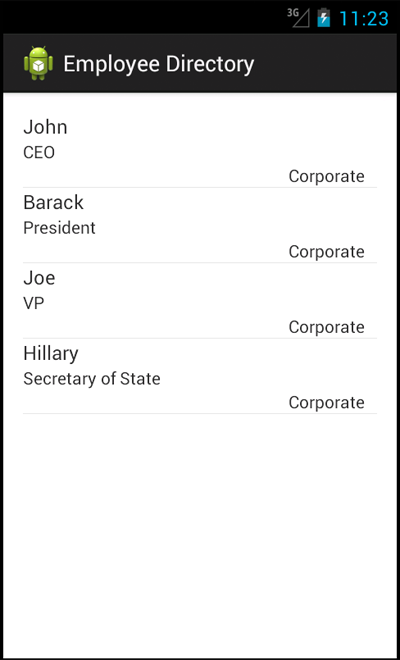 Continuing with the mobile employee directory example, I’ve added persistent storage with an SQLite database. //			1) Modify LoadEmployeesTask to load the database. //			2) The database is created when called for the first time. This will also call the EmployeeXmlParser from within. //			3) A Cursor is returned that exposes results from a query on a SQLiteDatabase. //			4) The SimpleCursorAdapter displays the data from the Cursor. private static final String CREATE_TABLE_EMPLOYEES = "CREATE TABLE " + TABLE_EMPLOYEES + " ("
+ COLUMN_ID + " INTEGER PRIMARY KEY AUTOINCREMENT, "
+ COLUMN_FIRSTNAME + " TEXT NOT NULL, "
+ COLUMN_LASTNAME + " TEXT NOT NULL, "
+ COLUMN_TITLE + " TEXT NOT NULL, "
+ COLUMN_DEPARTMENT + " TEXT NOT NULL, "
+ COLUMN_CITY + " TEXT NOT NULL, "
+ COLUMN_OFFICE_PHONE + " TEXT NOT NULL, "
+ COLUMN_MOBILE_PHONE + " TEXT NOT NULL, "
+ COLUMN_EMAIL + " TEXT NOT NULL, "
// This is where the creation of tables and the initial population of the tables happens. + COLUMN_FIRSTNAME + ", "
+ COLUMN_LASTNAME + ", "
+ COLUMN_TITLE + ", "
+ COLUMN_DEPARTMENT + ", "
+ COLUMN_CITY + ", "
+ COLUMN_OFFICE_PHONE + ", "
+ COLUMN_MOBILE_PHONE + ", "
+ COLUMN_EMAIL + ", "
+ "\", \"" + String.valueOf(employee._title) + "\", \"" + String.valueOf(employee._department) + "\", \"" + String.valueOf(employee._city) + "\", \""
+ String.valueOf(employee._officePhone) + "\", \"" + String.valueOf(employee._mobilePhone) + "\", \"" + String.valueOf(employee._email) + "\", \""